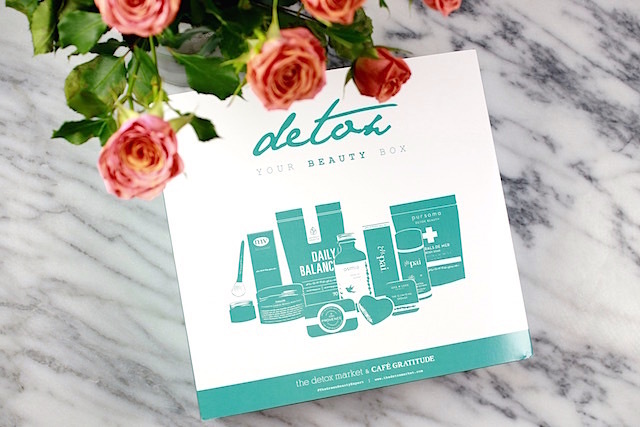 The only thing better than unboxing a new beauty product is… unboxing more than one product– easy answer, right? Ideally, as many as possible. 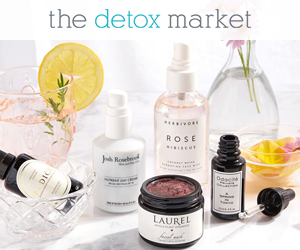 At The Detox Market they understand that, so they created a beautifully curated, new beauty box* (you may remember the previous one mentioned in this post). This time, the box was created in collaboration with Café Gratitude, a California-based chain of 100% organic, plant-based restaurants. Café Gratitude is actually housing Detox Beauty Corners at their locations where you can shop beauty products while you wait for your food to be ready — Honey, can we please move to L.A.? 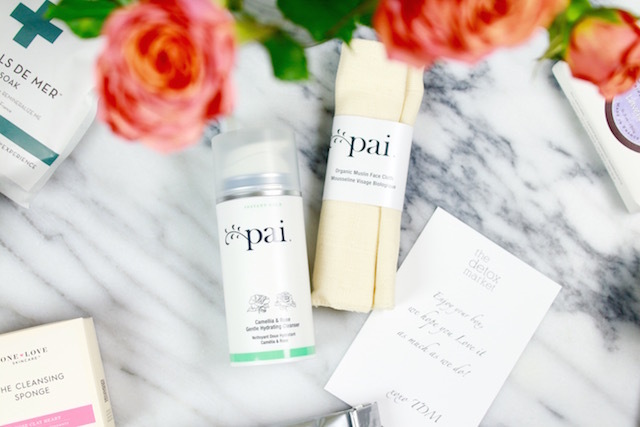 …the Pai Skincare Camellia & Rose Gentle Hydrating Cleanser. Well, wow. I forgot how much I like this cleanser and how well it removes makeup. It has a creamy, light texture that emulsifies ever so slightly, lifting all of the gunk off my face. It feels very soothing, so it’s a lovely option for a first cleanse. My only recommendation is to take it off with a face cloth to make sure that all residue is properly removed. The product comes with an organic cotton muslin cloth, which is not gentle enough for my skin, but works great for most skin types. You may also use this cleanser in combination with another gem that comes in the beauty box, which is the One Love Organics Cleansing Sponge. It’s a face sponge made with konjac plant fiber–Konjac is a plant grown in the remote areas of Asia, typically used in Japanese cuisine, and is none other than a cool-looking potato. 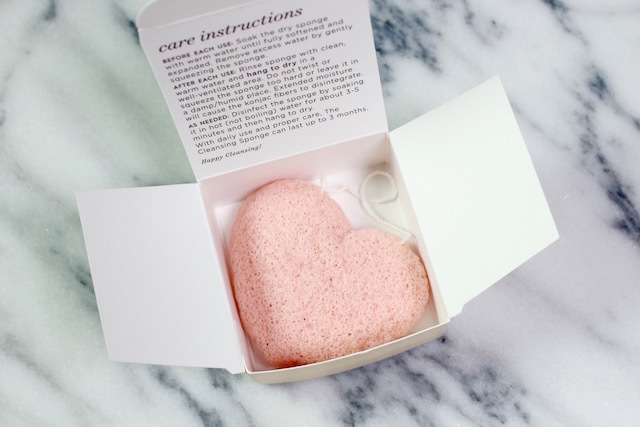 This clay-infused sponge provides the most gentle exfoliation. It may actually be used on its own by simply adding water, which makes the sponge expand in size, but I do prefer to add a pump or two of a gentle cleanser to it. It’s a lovely accessory for those who find skincare tools like the Clarisonic to be harsh, but that have lazy fingers that do a pretty sloppy job with cleansing, *raises hand*. Once your face is all nice and clean from using the sponge and the cleanser, it’s time for a good face mask. 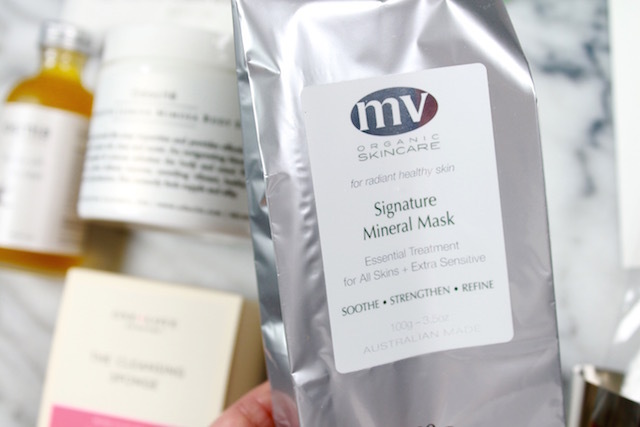 The beauty box includes the MV Skincare Signature Mask, which comes with a mask applicator brush and a mixing jar. It’s a French white clay mask, which is a good option for practically all skin types. It is one of the most gentle clay types (so mild that it should not bother even the most delicate skin types), but it is rich in minerals and has good oil-absorbing properties. 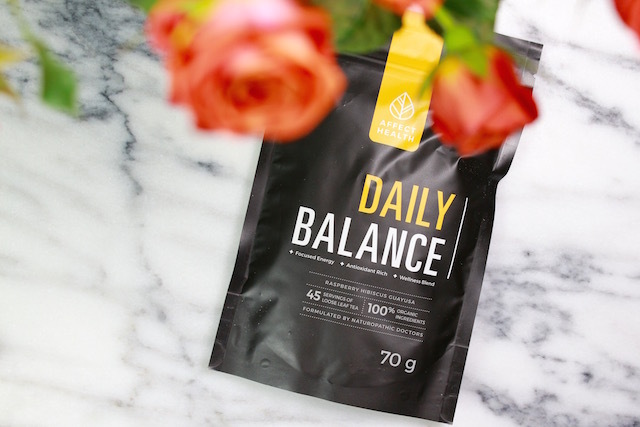 Sharon, the founder of MV Skincare, recommends to remove the mask before it is completely dry, in order to prevent the clay from sucking moisture out of your skin, which is a great tip for people with dry skin. As an expert facialist, Sharon knows what she is talking about, so I do advise that you follow her recommendation, but you do you — I keep mine on until I can no longer move my face and I am forced to speak in gestures. 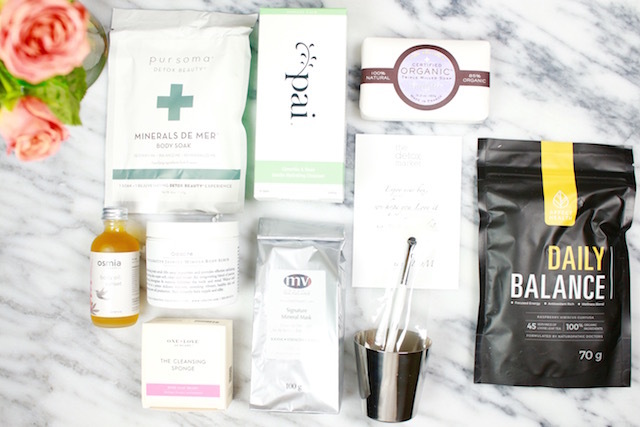 While your mask is on, you might as well have a nice detoxifying bath using the Pursoma Minerals De Mer Body Soak so you can have the complete holistic spa experience (preferably with your favorite music playing in the background and your favorite candle burning), and you might sip on a delicious Affect Health Daily Balance Tea (formerly Teatox Company, which I reviewed here). Then, reach for the Lavender-scented Pure Provence Triple Milled Soap to cleanse your body with a mild, non-drying lather, and for those dry/neglected skin areas that need a little extra love, such as knees, elbows and feet, use a small amount of the Odacite Invigorate Jasmine Mimosa Body Scrub. This is the only product I have tried that contains lemongrass (not my favorite to be honest) and still smells absolutely divine to me (perhaps because it also includes an uplifting blend of jasmine, ylang-ylang, and mimosa). The Walnut shell powder lifts dirt and dead skin revealing fresh, soft skin — ready to be moisturized. As soon as you get out of your bath tub–or shower cabin, if the bath tub is not an option, and while your skin is still damp, pour a few drops of the Osmia Organics Sunset Body Oil. The serum is going to seal in the moisture and keep your skin soft and supple thanks to conditioning plant oils like Kukui, Rosehips, Avocado, and Borage, just to name a few. The scent is sweet, earthy, and just a tad spicy, like a delightful, relaxing Spring sunset. Available at The Detox Market (here). Limited Quantities.